The sand nests of a small Japanese Pufferfish are an ephemeral underwater masterpiece. Image from Life Story, Courtship. If you’re into marine aquarium fish, and your friends know it, they may have shared this video a time or two via social media. This is one video we can watch over and over, and for those who have missed it, the backstory behind this interesting natural wonder is truly mind bogging. 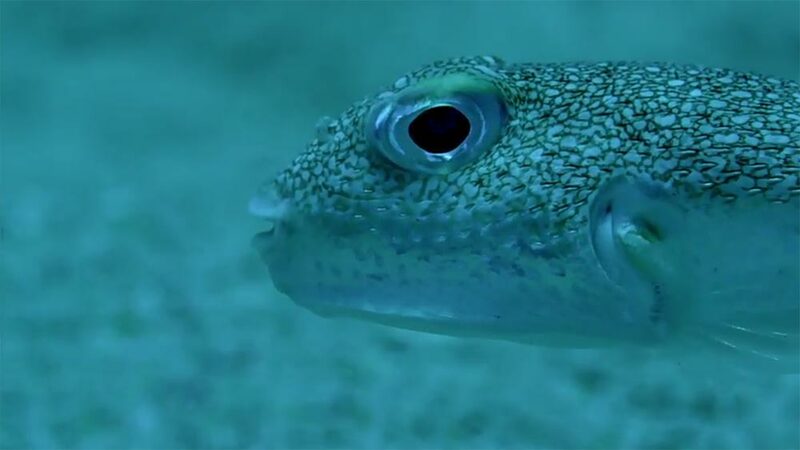 The enthusiasm for this story is entirely understandable: the incredible footage from the BBC’s series Life Story, episode “Courtship,” narrated by Sir David Attenborough, shows the painstaking lengths that one small marine fish goes to in order to attract a mate. According to the website Spoon & Tamago, these strange underwater “crop circles” were discovered by freelance underwater photographer Yoji Ookata “while diving in the semi-tropical region of Amami Oshima [Japan], roughly 80 ft below sea level.” Initially, no one knew what they were or how they were formed. 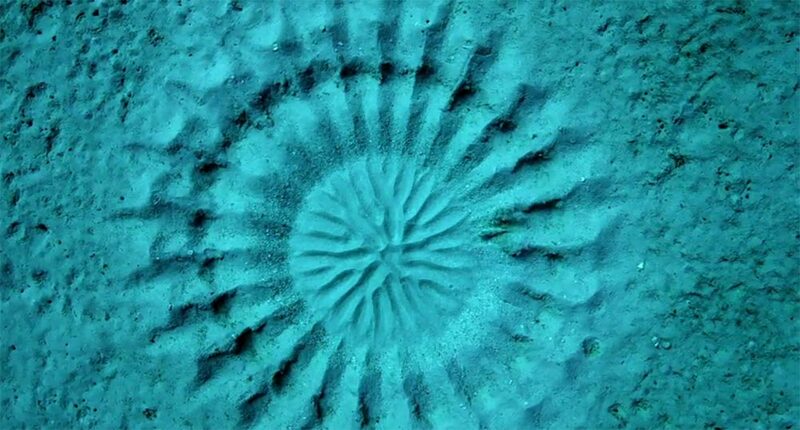 It was eventually revealed that a small pufferfish species constructs these beautiful nests. 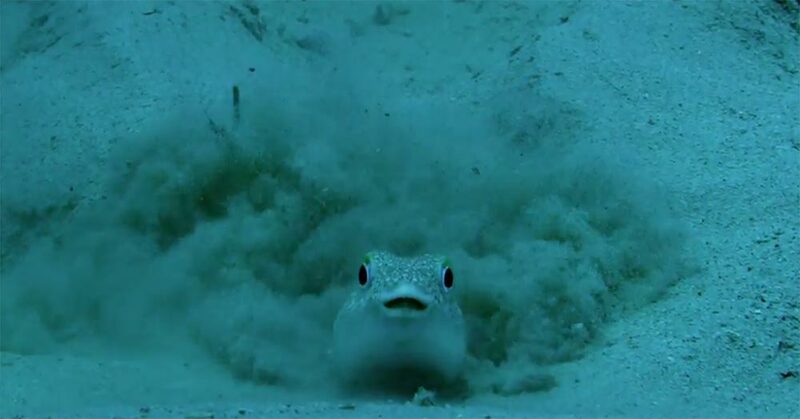 A male pufferfish uses his fins to dig and move the substrate to create the nest. Image from Life Story, Courtship. Researchers suggest that these elaborate nests actually serve a dual purpose, not only attracting a mate, but also slowing water currents to create an ideal nest for the incubating eggs. It’s highly unlikely that you’d ever get to witness the nest-building in your home aquarium, as the nests are reportedly 2 meters (approx. 6.5 feet) in diameter! So for now, this amazing engineering feat is best observed on film (if you can’t make it to Japan)! A Radio Times story further elaborates on the spawning and incubation process for the species, in which the male bites the female’s face while swimming side-by-side until spawning. The story also gives a glimpse into how the BBC’s footage was captured, illustrating the camera support frameworks used. After this unique pufferfish was featured in Life Story, it received a formal description as a new species, Torquigener albomaculosus. Torquigener albomaculosus, image from Life Story, Courtship. Radio Times: Why does David Attenborough think this fish is “unbelievable”?